Has anyone done any work with bamboo as the wood component in earthbag construction? From what I hear of the properties of the material, it would seem a natural, and there is certainly plenty of it where I am planning my construction. Most likely, but most people don’t publicize their projects. The general rule of natural building is to use what’s locally available and practical. Thanks for making all these plans. I own your square house bag book. 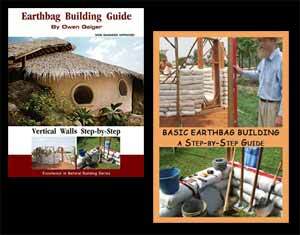 Have you ever designed a house with tires half way up the wall then earthbag on top of those? Tires used to support the earth backfill. You can do that. Tires are super slow to fill and pound. I’d rather use earthbag tubes or bags. Use the 24″ wide ones if you need to retain soil. Hi, I just bought 10 acres up on the Mogollon Rim in Arizona, it’s up at about 5 or 6′ feet and the East side overlooks a beautiful canyon…I’d love to build an earthhome on this property…this is high desert so do you have any recommendations or suggestions? Can you get scoria in that area? Search our blog for the Scoria Casita to learn how to save lots of time, labor and money. Scoria is lightweight, easy to work with, rot proof, fireproof, etc. Start with a simple roundhouse which is the easiest way to build. Expand later if you want. Savvy discussion – I Appreciate the insight – Does someone know if I could possibly obtain a fillable permit search document to complete ? 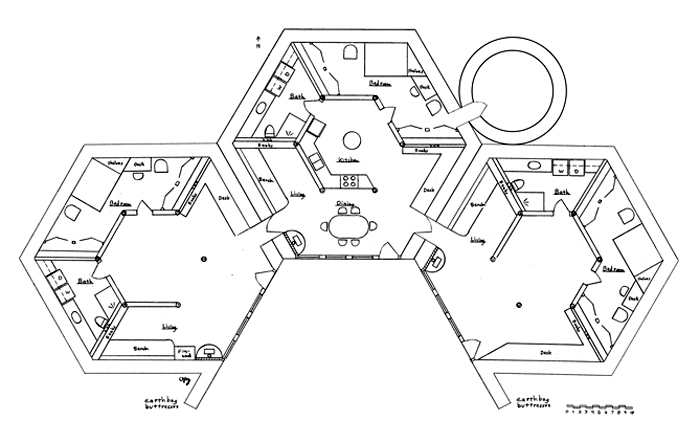 What is the footprint do the earth lodge cluster? Owen, thanks for all the help thus far. 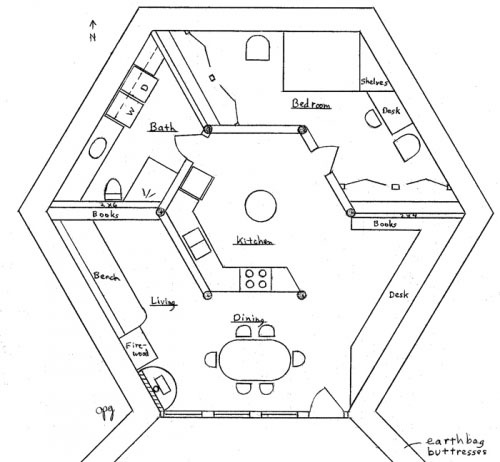 I downloaded the free plans for the root cellar. With a little modification I think I’ll build that in the area I want the Earth Lodge and see how it works for ease of building and water proofing. I’ll try to do photos and maybe videos and if I can do that I’ll pass them on to you. What is the difference between “high ground” and hilltop. Where I am there will be some moving of water. After a good soaking rain it will run off my hills for a couple of days. I can dig out an area that is not likely to flood build the house and then back fill is that better than just putting it into the side of a hill? I think my two greatest concerns are energy consumption and tornadoes. In 21 years I’ve never had a tornado here but they do go all around me. Talk to local builders who can answer questions for your specific site. Without seeing the site, it’s impossible to give specific information. In general though, choose a site that’s won’t flood and isn’t exposed to tornadoes. Some compromise may be required. For instance, an earth lodge is highly tornado resistant, so you could build on higher ground and probably still be safe. Build strong storm shutters and you should be okay. Be extra careful waterproofing the back side of the structure and roof. Use multiple layers of 6 mil poly sheeting. Add one or two swales to divert water. Use pond liner on the roof even though it’s expensive. I bought the PDF book on walls. I am in a position to place the house just about anywhere I want as far as direction. I have hills that will allow me to place it N, S, E, or W or anything in between. A South facing house would be close enough to use the current water well. I want to do as much as I can to limit heating and cooling bills. I can build into a hill or on top. Which plan would be best for this situation? I prefer to build on high ground to avoid water problems. Add berming/earth sheltering later. Hilltops are usually not the best choice. The house will stand out and be exposed to the wind and cold. Try to blend it into the terrain and save the best ground for other uses. Face the wall with most windows toward south if you live in the northern hemisphere. Choosing a plan is a personal decision based on your needs.